In the fall of 1973, the late J.M.Lumby (Jim), a Charter member of the North Delta Lions Club (also past member of the Delta Parks and Recreation Commission and past Delta Citizen of the Year in 1978) presented to the club the idea that we should do something in North Delta for the benefit of our "Senior Citizens". A proposal to establish a Senior's Drop-In Centre was endorsed by the Lions members, and feelers were put out to find a site that would be available and suitable. Lion Jim discussed this with Douglas Watkins (a past Alderman and real estate agent) and was advised that the Grasby residence on 88th Avenue (Kennedy Road) would be an excellent site. Doug was successful in obtaining the property on the condition that it would be used for community purposes. Together with Lion Jim Lumby, Doug was successful in having the Parks and Recreation Commission purchase the property. The North Delta Lions immediately put aside $3,000 as start up money to do needed renovations. Members of the Club along with their wives spent the first weekend the house was available washing floors, walls and began painting. The Drop-In Centre was operational. December 1975 - Lions completed additional repairs and painting at a cost of $500. March 1976 - Eight Lions put in 136 hours renovating the bathroom. Another seven Lions put in a further 28 hours to finish this task. December 1976 - Lions Club members build a wheelchair ramp at the rear of the house (entrance to the original kitchen) and installed an iron safety railing. This work was completed in January 1977. The membership of Kennedy house grew faster than anticipated and quickly had outgrown the original facility by 1983. With permission from the Corporation of Delta, the North Delta Lions Club began a drive to raise money to construct a new building. A member of the club, Lion Gerry Blonski (a certified architect) prepared the plans for the new building and donated them to the North Delta Lions. These plans were approved by the Corporation of Delta and the construction began. The North Delta Lions Club was successful in raising $275,000 from many sources. With the help of volunteer labour and donated materials and equipment, the project was completed. In October 1984, the Kennedy House Seniors Centre building was officially opened and gifted to the Corporation of Delta; debt -free. In return for the Kennedy House Seniors building donations, the Corporation gave the North Delta Lions Club a permanent storage room and under a perpetual contractual agreement, use of the main hall one night per month, free of charge. A Lion's crest was mounted on the front of the building, identifying the North Delta Lions Club's major contribution to the Kennedy House Seniors Centre. The start of the building project was a momentous occasion. The sod turning was done by then Alderman Lois Jackson (later to become Mayor). The event was observed by other Council members of the day, as well as executives of the North Delta Lions Club. Many thanks must go to the late Lion Basil Thornthwaite and late Lion Graham Warburton for the many hours they donated overseeing the project and arranging times for the many sub-contractors to do the work required. A great deal of thanks must go to the late Lion Jim Lumby who was successful in raising much of the monies for this project. Lastly, a special thanks to all of the hard working Lions members that worked in the pouring rain and also in the heat of the day, to make Kennedy House Seniors Centre happen. 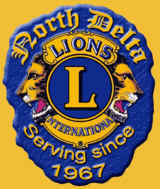 Each and every North Delta Lions Club member is proud to support and be associated with the North Delta Seniors. The Kennedy House now uses the name Kennedy Seniors Recreation Centre.